Belgian Gymnastics: Top Gym 2015: gold for Axelle Klinckaert! Top Gym 2015: gold for Axelle Klinckaert! Next stop for our Junior gymnasts: the Top Gym in Charleroi, one of the most prestigious international competitions in the World. And here in Charleroi, a Belgian gymnast won the all-around title for the first time! I admit it, I was super excited to come back here. I realized I didn’t come in 13 years! When I was still a gymnast, this competition was the one to go to and I hoped that one day I would compete there. But this article is not about me. This 18th Top Gym was organized in a strange situation. Because of the terrorist attacks in Paris and because our country was in maximal alert, the United States, Canada, Czech Republic, Romania and Israel cancelled their participation. And the tournament was one somersault away from being cancelled too. But the organizers fought for it. And they were right. For the first time ever, a Belgian gymnast won the all-around title: Axelle Klinckaert (GymMax). And the fact that several countries withdrew wouldn’t have changed much about it. With the withdrawal of her teammate Nina Derwael (TK Sta Paraat - P. H. H. Hasselt vzw) because of a foot injury, all eyes were on Axelle. She had an amazing year (two gold medals and two silvers at the European Youth Olympic Festival, two silver medals in Marseille last week). In front of her home crowd, she only had one mistake, a fall on balance beam on her back handspring, back handspring to layout somersault (13.500). On floor, where her routine is now admired by a lot of fans from all around the World, she captivated the audience and she got the best score on this event (13.950). But the best was yet to come. She almost got a perfect score on vault : 9.766 in execution for her Yurchenko full twist (14.766). Just behind Axelle is another Belgian, Senna Deriks (Gymgroep AS). I was impressed by her on balance beam (13.600) and uneven bars (13.750). On vault, she performed a front handspring piked somersault with half turn (14.033). Senna is definitely a name that you have to remember for the future. As Axelle and Nina, Senna will turn Senior in 2016 and will be eligible for the Test Event. In 3rd place is Russia’s Uliana Perebinosova. Russian champion on uneven bars, she unfortunately fell but still scored 13.350. Julie Meyers, for Team Belgium, is in 5th place. Last week in Marseille, Julie had a rough day but I knew she could do better and shed id in Charleroi. She got 14.233 on vault and 13.400 on uneven bars, the 2nd scores of the team on this events. This Saturday wasn’t a good day for Maellyse Brassart (Gym Phénix). She fell twice on bars and once on beam. But she finished strong on vault and floor, earning 14.400 and 13.600 respectively. Maellyse is still young. She will turn Senior in 2017, so she has plenty of time to earn some experience. Her goal in 2016 will be the European Junior Championships. The team competition and the event finals took place this Sunday. 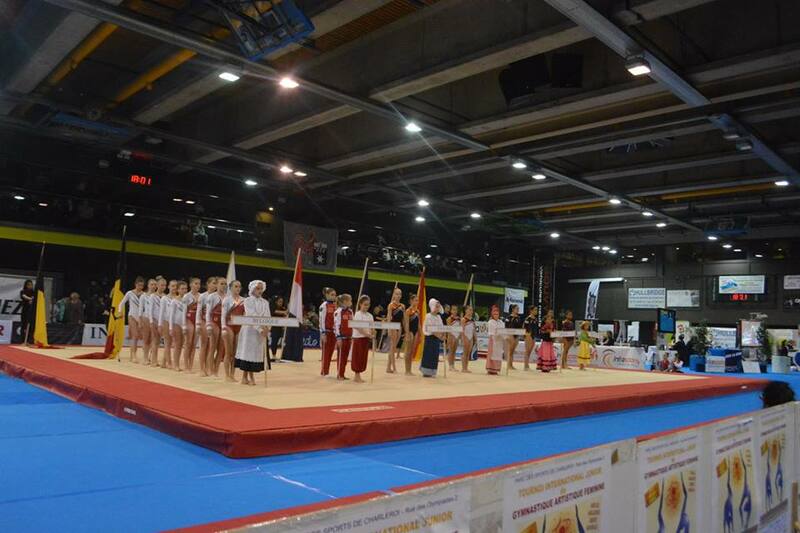 The team from Gymnos Charleroi competed with team France. Russia and the Netherlands paired up. Belgium 1 (Senna Deriks and Axelle Klinckaert) competed with South Africa and Belgium 2 (Maellyse Brassart and Julie Meyers) with Spain. Two scores count in the team total. I'll post the recap tomorrow! Top Gym 2015: Belgium shines in finals! Top Gym 2015: find out who will be there! Combs-la-Ville: great results from our gymnasts!